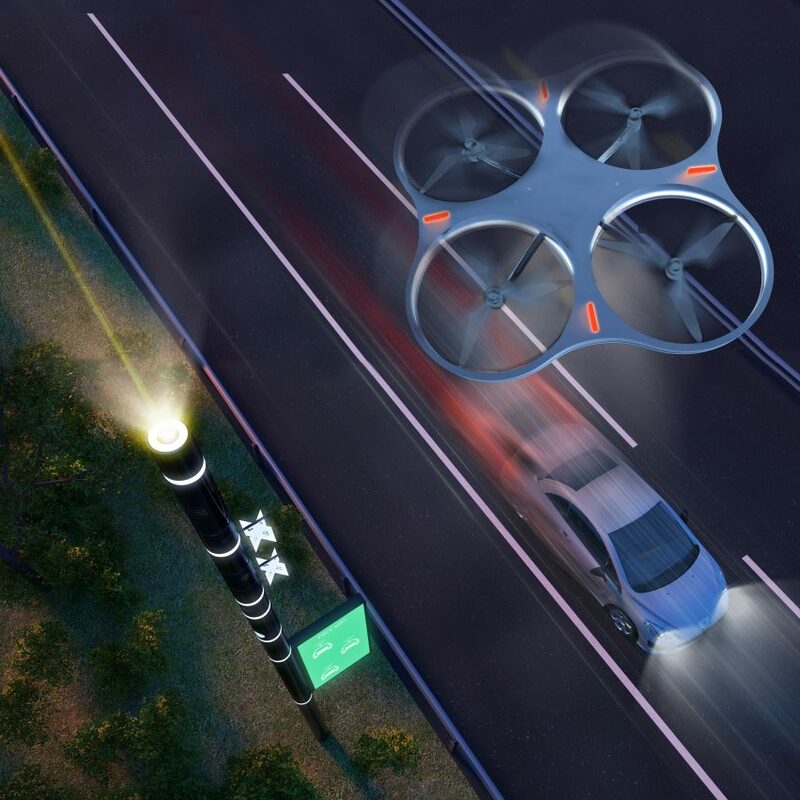 Italian architect Carlo Ratti has unveiled a concept for a smart road system, which would feature swarms of drones that deliver first aid, monitor traffic and detect accidents. The scheme was designed as part of a €30 million proposal by highways company ANAS, presented in late December 2017, to develop a new smart road infrastructure around Italy’s roads in preparation for the arrival of self-driving vehicles. The plan, which would be implemented on more than 2,500 kilometres of roads and highways in Italy, sees an infrastructure that includes drones able to deliver first-aid support and “flying poles” that can send useful information to vehicles – for example, the conditions of the roads ahead. The so-called “flying poles” feature sensors that detect major environmental changes, from air pollution to wind speed and humidity. This information would then be sent to vehicles via Wi-Fi and also displayed through low-energy panels that are attached to the main body of the poles. The poles come equipped with a recharging station, where passing drones can charge their batteries between monitoring the roads. 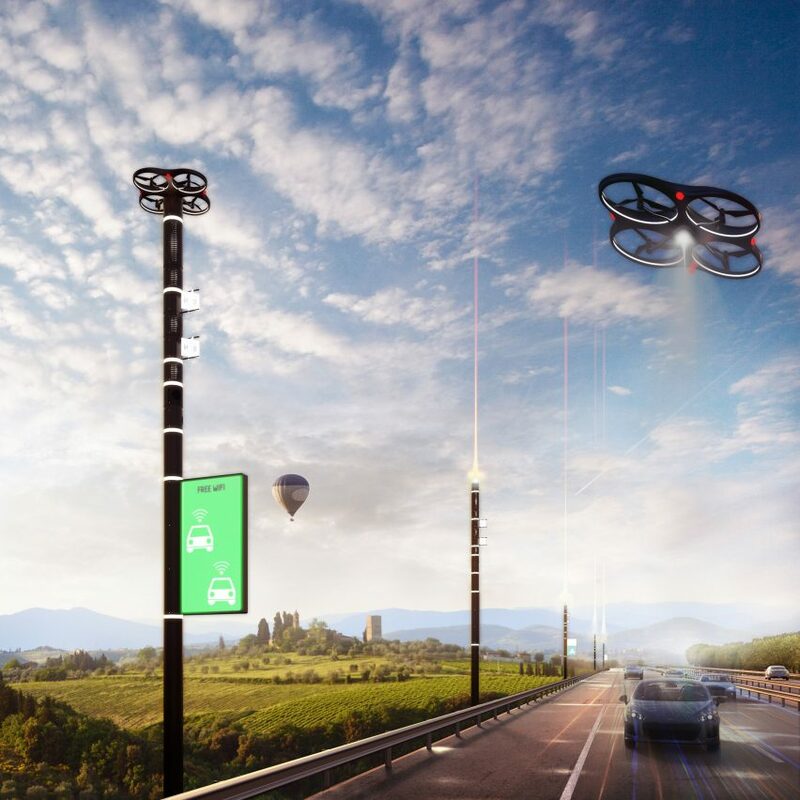 Ratti’s smart road would also be supported by a swarm of drones, which would function as both safety and maintenance aids – monitoring tunnels, viaducts and general infrastructure. They are also programmed to detect accidents, like fires and floods, and can bring medicine and first aid to drivers. Ratti’s proposal comes at a time where the race towards driverless cars is significantly picking up momentum. Self-driving cars are already being tested by companies including Apple, BMW, Ford, Mercedes-Benz, Google and Tesla and Uber. For the most part, governments have been slowly but surely welcoming driverless cars. In the USA, the Department of Transportation has pledged $4 billion (£2.8 billion) towards improving autonomous vehicles and providing the infrastructure to support them, based on evidence suggesting it will reduce road accidents. But last year, India became the first major economy to say no to driverless cars, with transport minister Nitin Gadkari saying the government “won’t allow any technology that takes away jobs”. Ratti, who teaches at MIT and directs its Senseable City Lab, is the founder of architecture firm Carlo Ratti Associati. The company has worked on a wide range of projects, from a retreat in the Himalayan mountains, to the “world’s first Internet of Things sofa”.